Honey bees are not native to North American. As such, its not surprising that the most beneficial plant species for honey bees are also often not native to North America. Without question, the most beneficial plant species for honey bees is sweet clover (Melilotus officinalis). Ask any beekeeper and they’ll quickly tell you how sweet clover produces the most honey, some of their best honey and their bees thrive on it. If your habitat project objectives are to benefit honey bees, the mixtures listed here will produce the most benefits. The pollinator benefits of these mixtures are not limited to honey bees. Many native bee and butterfly species also benefits from the nutritious benefits of these mixtures. Recent research results from a honey bee study conducted in Minnesota looked at the pollen that honey bees were bringing back to the hive. 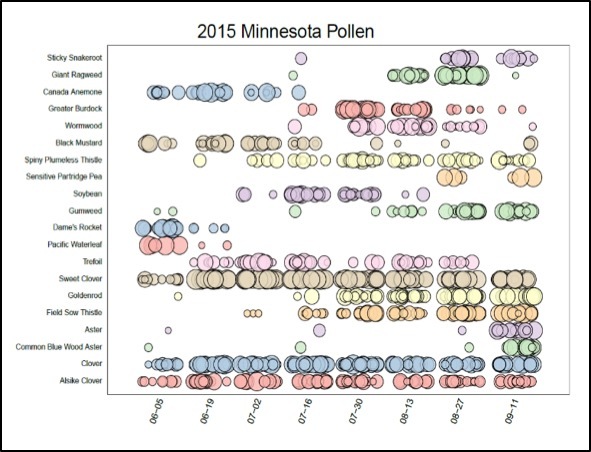 The study documented the plant pollen that bees were collecting, how much pollen from the plants were collected and the time of the year the pollen was collected. The graph shown here clearly identifies the most important plant species that bees ere using all clover species. The top three plant species for the amount of pollen collected and the time spent collecting it were sweet clover, alsike clover and clover. These plant species have strategically been included in the honey bee seed mixtures offered by Conservation Blueprint.